Standard engineering practice for the equipment you design may call for a roller chain or gear drives. Replicating these solutions feels safe. On the other hand, design changes pose risk and expense. So where do you find solutions that minimize risk and cost while offering a marketable advantage? The answer lies in drive conversions already made by industrial customers who are using your equipment or machinery. 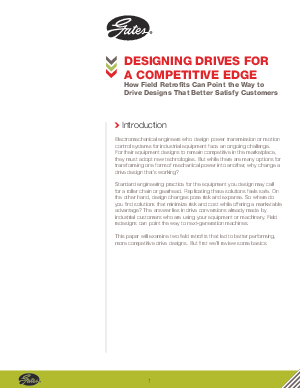 In addition to reviewing your drive design options, this white paper includes two case studies demonstrating how replacing older technologies with synchronous belt drives gave manufacturing facilities an edge in the market. Read how one bottling facility saved $330,000 per year by converting chain to Gates Poly Chain® GT® Carbon® belt drive systems. The belts don't stretch, require no lubrication, have less wear and last longer. Field experience is the true test of a drive system. When high maintenance or frequent replacement of drive components becomes the norm, it is time to reassess your drive design.